A criminal simulator , with Base building mechanic For Mobile with in game mechanics used on titles like clash of clan ,with a catch :p , it's an isometric third person shooter . you are a criminal , you start as a house thief and go up in ranks to attack banks , and raid army posts. and be even a hitman . go gun blazing and have a high wanted level . and you will suffer the wrath of other players in raids. Take it slow and sneak your way to loot or target , using masks and costumes ,a lower casualties counts is a bonus too . Base mode : here you build and protect your base using Turrets , mines ,traps, walls ... even a tesla coil :D.
Raid mode : you gear up character player head to toes , with armor and weapons , C4 ...Rockets . to attack other player bases when they are offline . - Looting mission: You go on Stealing Rampage agains Houses , banks , jewelry stores , or even army outpost. to collect items and money that will be used to build your base and craft other items. -Hitman mission : you have a target take it down simple . 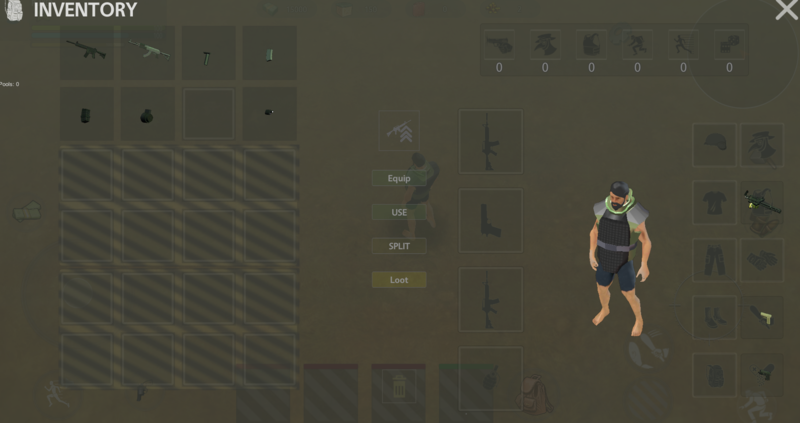 Mode 1 Air drop mode : a Rare item will drop on a random map and 4 players will join this map to fight for the air drop , last man standing takes the loot of all players and the rare item . Mode 2 :4 players join a closed arena to fight to the death last player standing takes it all . The game is inspired by hours of playing rust and Pubg , but it's unique on it's own way. 40+ weapons and each weapon have unique different attachments . each weapon have different Rate of fire and recoil , ammo capacity and durability. you can protect your head or you can put a mask that will lower your wanted level .